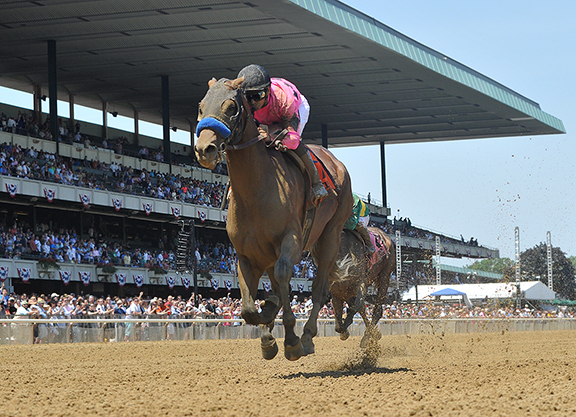 EASY GOER S., $150,000, BEL, 6-10, 3yo, 1 1/16m, 1:41.50, ft.
Thoroughbreds LLC (KY); T-Bob Baffert; J-Mike E. Smith. LLC; B-Bryant H. Prentice (KY); T-Chad C. Brown. $30,000. 3–Outplay, 117, c, 3, Bernardini–Miss Kate, by Storm Cat. ($70,000 Ylg ’15 KEESEP; $275,000 2yo ’16 OBSMAR). O-Repole Stable; B-G. Watts Humphrey (KY); T-Todd A.
Pletcher. $15,000. Margins: 3 3/4, 2, 7 1/4. Odds: 1.85, 3.10, 7.30. Also Ran: Jamminwithbrandon, Tale of Silence, Wicked Macho, Local Hero, Lookin At Blessing, Sonic Mule. Scratched: Perro Rojo. West Coast sat a perfect trip and ran away in the stretch to get the Saturday stakes action underway in the Easy Goer S. at Belmont. A winner at second asking Mar. 12 at Santa Anita, the $425,000 Keeneland September buy took a tough beat when caught in the final stride by GI Belmont S. entrant Senior Investment (Discreetly Mine) in the GIII Stonestreet Lexington S. Apr. 15 at Keeneland. Coming in off of a workmanlike allowance/optional claiming win back in Arcadia May 20, the bay was bet to favoritism here and got squeezed back some at the start before settling in sixth behind a sharp pace of :22.79 and :45.62. Advancing three-deep on the turn, West Coast swept to the lead easily at the top of the lane and quickly kicked clear en route to a convincing triumph. You’re to Blame (Distorted Humor) finished full of run from last to get second money. The winner’s dam, heroine of the 2000 GI Breeders’ Cup Juvenile Fillies and that year’s champion 2-year-old filly, foaled a Carpe Diem colt Feb. 18. Victorious pilot Mike Smith added, “He’s a nice colt. It was my first time on him, and after the way he ran, I kind of wish they entered him in the Belmont. He loved this racetrack. He was squealing and playing, I thought ‘man don’t you know we have to run here?’ But he just loved it.” Click for the Equibase.com chart or VIDEO, sponsored by Fasig-Tipton.